The emulator overrides defective occupancy mat error and fix an airbag warning light. Instead of replacing faulty occupancy mat (which requires de-installation of the seat) you can install the emulator which is a safe and inexpensive solution. This is also a great solution if you installed bucket seats. The device sends a signal about the presence of a passenger on the seat (even in his absence). The airbag warning light should be turned off. In case of an accident, airbag will ALWAYS deploy - with or without a passenger on the seat. The device is for diagnostic use only. Do not not place the child seat on the front seat! This emulator will ONLY work with cars that have the Weight Sensing System seat mat (WSS mat). 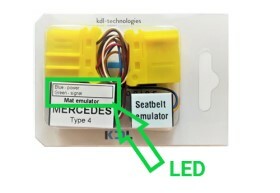 The WSS mat has 4 wires (colors are: red, green, brown, yellow) and was mounted only in Mercedes-Benz cars made after 2004/2005 for North American market (USA and Canada). To verify which mat you have, locate the seat mat plug under the passenger seat (at the back side). Different emulator is needed if you have a 2-wired or 3-wired seat mat. In some cars it is needed to connect +12V wire to another power supply (where power is supplied only after turning ON the ignition). Otherwise the emulator can cause discharging the battery. The emulator is neither a toy nor a magical device that solves every SRS problem. Mercedes has a few sensors that can cause the airbag warning light. You have to perform diagnosis with a diagnostic device before purchase (we recommend the Star Diagnosis) to make sure your problem is related to a faulty seat mat. The most common error related to a faulty seat mat is "Component B48". If the errors show "short circuits" or "open circuits" we advise you to visit your local car electrician first before purchase. In most cases "short circuits" and "open circuits" indicate problems with car's electric installation (there might be damaged/loose wires or connectors). The emulator will not solve these problems and will not work with damaged electric installation. It will be like plugging an electronic device to a power socket with damaged or disconnected wires. This emulator only solves problems caused by faulty seat mat. Please remember that the errors appearing on the car’s dashboard are NOT an indication that a seat mat is broken. The emulator is a plug & play device. Locate the seat mat plug under the passenger seat, unplug it and replace it with the emulator's plug. The LED light on emulator should start to blink alternately blue/green or red/green light (depends on the emulator). It means the emulator has a signal and connected successfully with the Airbag Control Unit (ACU). The airbag warning light should turn off automatically (sometimes it is necessary to delete old error with a diagnostic device to remove the airbag warning light). No blinking lights or one color missing mean there is a problem with proper communication with the ACU. After the purchase you will receive detailed installation instruction on your email address. Contact us if you want to read the instruction before purchase. Let us know if our item is not working properly or is defective. We will help you solve the issue, replace the emulator with a new one or cover the return shipping and give you a full refund. Please remember, sometimes it is also necessary to delete old error with a diagnostic device to remove the airbag warning light.